Piyel Maawul, the 'battle sandbar,' extends off the Eastern end of Mogmog, towards Sohl'oay. “The sandbar at the Sohl’loay end of Mogmog, we call it Piyel Maawul, Hosay states. " It’s a sandbar where battles took place. 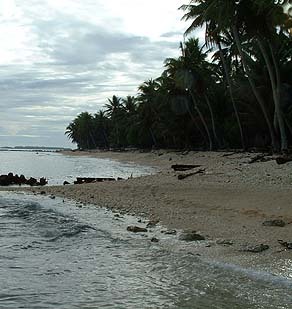 A long time ago, some warriors came and landed on that beach and they started fighting with the people from here. Maawul is when we fight in group, just like war. World War II, we call it maawul. But when it’s between just two or three persons, we just call it ‘fight,’ not maawul. "So they come up with this plan. They started collecting shells, conch shells, helmet shells. Now the meat of these shells was considered a delicacy here. 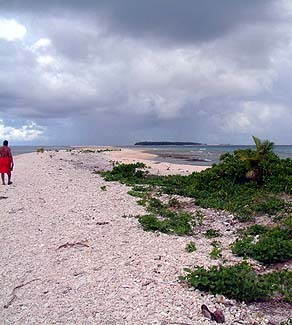 So they would bring in canoe-loads of shells and give to the people here on Falalop. Location of Piyel Maawul. 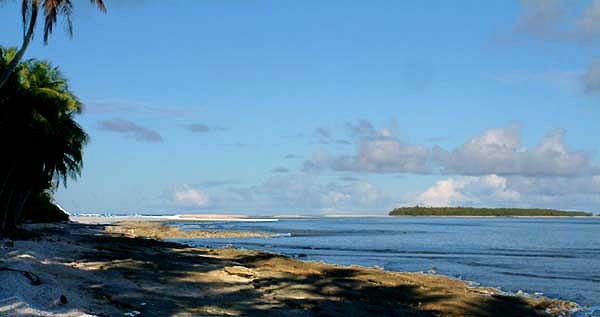 L'oosiyep is the largest of the "turtle islands" that are outside the main lagoon. “They continued on doing this. The people of Falalop would pull the meat of the shells and they would just pile these shells beside their houses, beside their homes. The L'oosiyep people kept on bringing the shells and watching the piles of shells grow, until such time that they saw the piles to be all over the place. That’s when they came. “They came and tried to make friends with the Chief of Falalop. They asked the chief if they could hold what we call hachiiulaep. 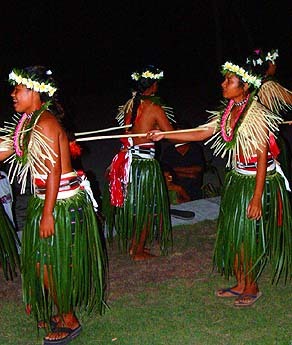 Hachiiulaep is when the islands join together to celebrate and dance. So they hachiiulaep: they dance and dance, dance today, dance tomorrow. They were trying to wear out the people of Falalop, dancing every night. "Then on the assigned day, that’s when the warriors came. By that time the people of Falalop were tired from dancing for so many days." “So this last day before they fought with the people of Falalop, the L'oosiyep warriors arrived on Falalop while the dance of hachiiulaep was going on. There was a part in the chant of the dance that was the signal, because the warriors set themselves among the houses, close to each pile of the shells. So when the sign was given, that’s when they started fighting, and they beat the people of Falalop. "The L'oosiyep warriors were throwing these shells. They weren’t worrying about running out of shells, because they had all these shells they had brought to Falalop! And the Falalop people had piled those shells in the convenient spots. "The man who told me this story, he was here during World War II. So when he told me this story, he expressed the sound of those shells to be like the sound of the shells as the military was shelling through Falalop. I mean, that’s how fast and strong the shells were thrown, making all this hollow sound, whoooooooooop." A Ulithian spear of the type that would have been used in these battles. “So they beat up the people of Falalop. Some swam to Asor, and some swam or walked on the reef from Asor to Sohl’oay, and spread the news around to Mogmog that something’s happening, something’s coming. "After here, the L'oosiyep warriors went to Asor. By that time the news has reached Mogmog; that’s when the Mogmog people got ready for them. So they beat Falalop, beat Asor, beat Sohl'oay. When they got to Mogmog that’s when they were stopped by the Mogmog warriors. They got as far as that sandbar. “Mogmog people were expecting the L'oosiyep warriors to come from that end, because they had to come through Sohl’oay to get to Mogmog. So in the sand bar extending toward Sohl’oay, there the Mogmog warriors buried themselves and waited for them, hidden under the sand. Once the L'oosiyep warriors reached that sandbar, they were attacked by the Mogmog warriors who sprang up out of the sand." “One version of the story, from here on, says they retreated back to L'oosiyep, recuperated a little bit, prepared again, and then went back to Mogmog. Several attempts were made, until they were able to kidnap this Princess, the daughter of the chief, who was taking a bath in the water by the shore." “The General of the group that came from the L'oosiyep—a Prince—saw a daughter of the chief of Mogmog,” Alphonso relates, “and wanted to marry her. This was during the hostilities, and so he was going to just grab her. There were two daughters, they had the same name. And he was going to grab the young one and take her back to L'oosiyep. Out on Piyel Maawul. Sohl'oay is in the distance. “My version of the story,” Mariano continues, “is that the Prince of L'oosiyep was wounded during one of these attempts. He was wounded and was left for dead, or maybe he jumped into the water and swam a little bit to other parts of Mogmog. It so happened that when he came up on the beach it was in front of the Women’s House. He couldn’t walk, he was too wounded, he just came up on the beach and probably passed out. "Early in the morning the next day, while it was still dark, a princess of Mogmog came down to pee, and it so happened that she peed on him. That’s when he came to, and was moaning and the lady was scared. That’s when the lady found this man, and found out it was one of the L'oosiyep warriors. So she tried to hide him and nurse him back to health. “That’s when they got to know each other—now this is my version—and finally they fell in love. They decided to get married, and so the Prince took the Princess to L'oosiyep. They got married and the Princess became pregnant." 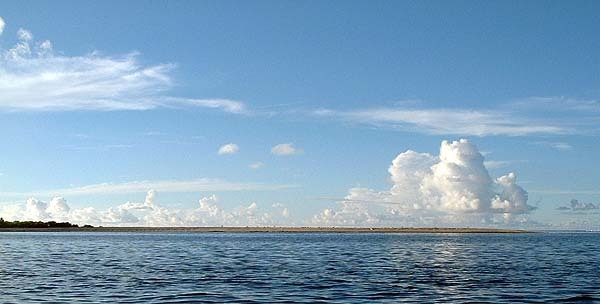 Piyel Maawul as seen from the lagoon. “Now he had to return the Princess to Mogmog, because here in Ulithi, the husband takes the wife back to her parents to have the baby, should something happen during delivery." “They came back from L'oosiyep with a lot of canoes,” Alphonso explains, “and lot of food for wedding party, as well as weapons, and they anchored in front of Mogmog. Now no one went out, and no one came in—they were all afraid. But the Princess was on the canoe. So she’s the one who got off and went in, went up to her father’s house, and explained what happened." “So the father, because he is the chief of the island, he collects all the helpers and asks them to gather lavalavas," Alphonso continues. 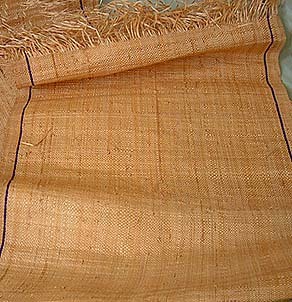 "Lavalavas are one of the top items of wealth here, even today. They collect those and then they start from the platform where the chief is, and they lay those lavalavas all the way down to the beach. And then the Chief stands aside from that and took another one. This is a special type on this island that belongs to chief only. Then he called out, and Prince got off the canoe and came in. “Now the Prince was going to walk away from that row of lavalavas, and the Chief says, ‘no, you have to walk on this.’ And he turned to the Chief and he says, ‘Chief, I know that we are sort of enemies because we’ve been fighting for a long time, but I still know that you are my chief. And if you make me walk into this thing, all the way up there, you’ll put some kind of curse or spell on me." A pathway was made with lavalavas. 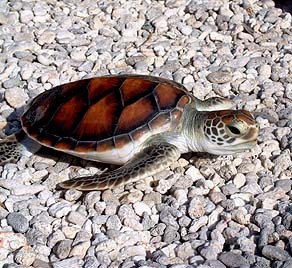 A young green turtle. Because of the events of this story, all turtles now belong to Mogmog. “But the Chief says ‘No, this is the peace treaty: you walk on this path and everyone will look at you and know that you come in peace. So, he complies and then walks on the lavalavas up to the platform. At that time, you had to carry basket all time, just like here in Yap today. So he took the one that he was carrying, the one for chiefs, and he put it down and took the basket and put it on top of the platform. And that began the negotiating of peace." “Then when the Princess delivered the baby,” Mariano says, “the husband—the Prince—would go to L'oosiyep, take some turtle meat, and would bring it to Mogmog for the mother to nurse the child. It went on like this and finally he increased the amount of meat he brought to Mogmog, and this went on, the amount kept on increasing until it became a whole turtle." "When she delivered the son, the Prince from L'oosiyep went back and told his father to let him give all the turtles from L'oosiyep to Mogmog, for his child,” Alphonso adds. “And that’s how all the turtle got to Mogmog,” Alphonso concludes.